The aspiration to see God has been a persistent characteristic of Jewish esotericism throughout the ages. The way this vision has been imagined has, however, changed in keeping with different theological conceptions over time and place. The centrality of visualization in kabbalistic traditions beginning in the twelfth century has been of interest to scholars from Gershom Scholem to those of our own day, among them Haviva Pedaya, Elliot R. Wolfson, and Moshe Idel. One of the characteristics of the Kabbalah is the visualization of the divine as a structured, objectivized phenomenon. The Godhead is understood as a kind of machine with spatial as well as dynamic features. Just as the constellations of the heavens were given to graphical visualizations and mappings, the constellation of divinity (in Hebrew, ma’arechet ha-elohut) could be diagrammed, and was. Thanks to the generous funding of the Israel Science Foundation, the Ilanot Project team has prepared and published articles, critical editions, and an online database — all while conducting “basic” research in this understudied field. 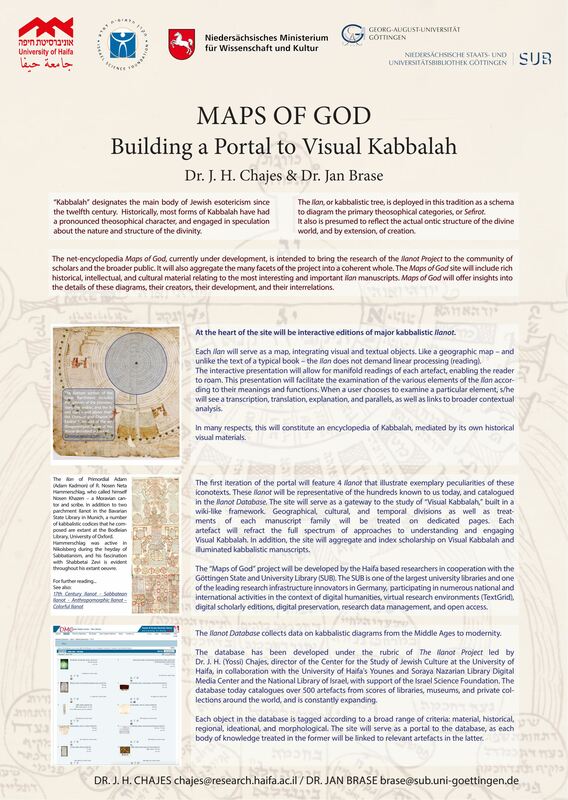 The Ilanot Project now aims to establish a sophisticated online digital platform that will make the richness and depth of the graphical Kabbalah accessible to scholars and interested laypeople: Maps of God. In the context of the Ilanot Project, as noted above, a database has been constructed in collaboration with the Digital Media Center at the University of Haifa. The database, which is already “live” online via http://ilanot.haifa.ac.il/site/?page_id=11, assembles hundreds of kabbalistic diagrams from the thirteenth to the twentieth centuries, from tens of libraries, museums, and private collections around the world — scrolls and codices, manuscripts and printed works, simple sketches and complex diagrams — and “tags” them according to a broad range of historical, ideational, material, and graphical criteria. The full fruition of the Ilanot Project is, however, still ahead of us: the creation of an engaging, accessible, interactive digital platform that will be dedicated to taking full advantage of our extensive research on kabbalistic images. The primary means of presenting this research will be via the kabbalistic diagrams themselves. More precisely, our research will be integrated into “live” versions of select images. Kabbalistic diagrams are, in many respects, maps of the divine world. The site will feature a number of images of Ilanot of particularly great significance. These images will become “live maps” that the visitor can freely explore to learn about any of their elements with a simple click. Every element in the image will become a “hot spot” bearing a hidden link, a “tag” within a complex visual artifact. A click will bring up a variety of options, from transcriptions and translations of texts to explanations, as well as links to other diagrams with comparable features. In this way, the Ilan itself becomes the portal to a rich encyclopedia of graphical Kabbalah. The encyclopedia itself will contain detailed information pertinent to the various major manuscript families of kabbalistic Ilanot: cultural-historical, intellectual, and aesthetic. In addition, the visitor will find explanations of the most common elements in these diagrams, information on the scribal artists who fashioned them, and visual-historical presentations of their development and interrelations. Like Wikipedia, the page devoted to each artifact will include links to other related, relevant pages within the encyclopedia, and of course to the existing database. Thus, for example, a visitor can explore the “Map of God” known as “the Great Parchment” – a particularly striking Renaissance diagram inscribed on a long vertical-scrolling parchment (see one exemplar of this family, Oxford 1949, to the left.) Through the “live” imge of this Ilan, the visitor will be able to discover the characteristic features of this family of manuscripts, its historical background, and the meaning of its various elements. In addition, s/he will easily be able to find additional exemplars of this manuscript family, and its visual and textual sources. The digital humanities initiatives of the Ilanot Project received two major grants in summer of 2018, paving the way for development through 2022. The Israel Science Foundation awarded four years of funding to “Art, Kabbalah, and Cultural Capital: The Making and Meaning of a Renaissance Cosmographic Masterpiece.” This project focuses on a great parchment ilan of Renaissance Italy, a cosmographic masterpiece first created circa 1500. This rotulus, which is extant in over ten witnesses, represents a creative aggregation, adaptation, and integration of the visual and literary sources then circulating in Jewish Italy. By untangling these elements and identifying their sources, assessing their transformations, and analyzing their interplay in this ilan of unparalleled scale and beauty, we will facilitate the discovery and understanding of a work the importance of which is belied by its effective absence from scholarship to date. The project will adopt an interdisciplinary toolkit, combining attentiveness to the social and cultural contexts of the emergence and reception of this great ilan, philological study of the roughly 30,000 word kabbalistic miscellany arrayed in and around its schemata, and art historical analysis of its representational and decorative elements. Applying cutting-edge approaches from leading historians of early modern science, we will also attempt the experimental reconstruction of the practice of making an ilan c.1500. These efforts will allow us to recover the tacit knowledge of the craft as well as the historical taxonomy of its graphical forms. The project will culminate with the publication of a monograph to be accompanied by a digital critical edition. The technologies developed to produce the latter will be invaluable to future scholars of the ilanot and comparable materials, from historical maps to Indian mandalas, making this a truly pioneering digital humanities initiative. The particular nature of ilanot presents challenges on a variety of levels, beginning with basic research and culminating in their publication and presentation to the general public. Studying the ilanot requires attentiveness to their graphical elements — including a full repertoire of iconography and diagrammatic schemata — as well as to their textual elements, which must be analyzed philologically. A large ilan will typically contain hundreds of image-text units that must be assessed in this manner individually and contextually before comparative study can be responsibly undertaken. Furthermore, the large format of ilanot — often nearly a meter wide and up to ten meters in length — and their nonlinear representation of the divine topography rule out traditional forms of presentation and publication, such as printed books. It is with this sense of scholarly imperative that Prof. Chajes and Dr. Baumgarten have teamed with SUB Göttingen to create “Maps of God”: a digital humanities platform for the advanced study—as well as introductory presentation—of the ilanot to scholars and the broader public. “Maps of God” will allow researchers to track image-text units in their specificity and more complex compound configurations, while inviting users to explore the most stunning and significant artifacts of visual Kabbalah in precisely the ways that suit them: from close study of individual parchments, assisted by transcriptions, translations, and commentary, to broad searches for concepts as they have been graphically visualized over centuries and continents. “Maps of God” will also be a platform for the publication of scientific editions of key artifacts, that are only representable and publishable adequately by these means.